Long-time low-temperature sous-vide cooking of meat enables the chef to precisely and robustly reach a desired gastronomic outcome. In long-time low-temperature sous-vide cooking, time and temperature can be used as independent parameters to control the outcome. From a scientific point of view, this raises the question how different sensory properties of meat respond to time and temperature and the nature of the underlying processes. Sensory properties of beef cooked at different combinations of low temperatures and long times were found to show three different time-temperature behaviours. By means of GEneralised Multiplicative ANalysis of VAriance (GEMANOVA), the behaviour of 18 descriptors could be reduced to three common time-temperature behaviours. 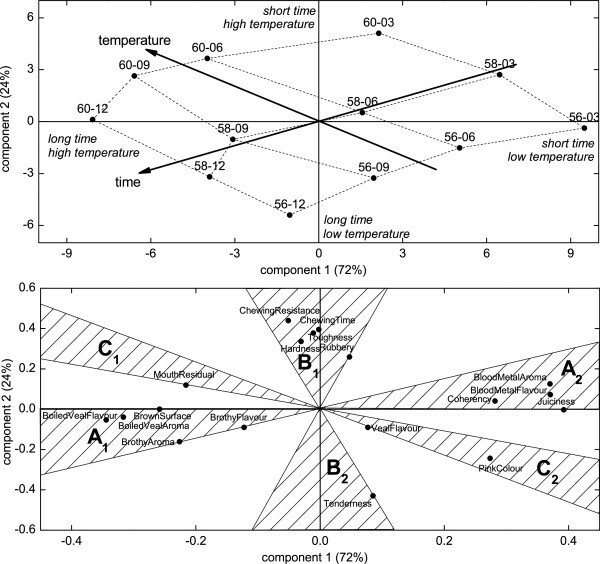 This resulted in three groups of sensory descriptors: group A where temperature and time dependency strongly affect descriptors in the same direction, group B where temperature strongly and time less strongly affect descriptors in opposite directions, and group C where temperature and only to a small degree time affect descriptors in the same direction. The underlying physical and chemical properties in these groups may be classified as depending on their response to time and temperature. Group A, consisting of mainly aroma and flavour descriptors but also juiciness, showed mainly kinetic nature; group B, consisting of texture descriptors (exemplified by tenderness), showed mostly kinetic nature as well; whereas group C, best exemplified by pink colour, showed little dependency on time and thus mostly reflected the effect of temperature. The results indicate that three different underlying main phenomena are responsible for the changes in the sensory properties during long-time low-temperature cooking of beef. Long-time low-temperature sous-vide cooking has received increasing popularity as the modern way of cooking meat. A reason for this popularity is that the gastronomic outcome (i.e. the sensory properties) can be precisely and robustly controlled by choosing appropriate cooking time and temperature [1–3]. The properties of the meat (e.g. which cut, animal age, ageing etc.) are responsible for the starting point of the sensory properties. However, this is not the concern of the present work, where the focus is solely on the cooking. Several processes take place during cooking that change the sensory properties of meat. The perceived sensory properties of meat after heat treatment can be described by a number of sensory descriptors related to aroma, taste, and texture. Examples of such descriptors are juiciness, tenderness, and hardness. The combination of sensory scores that corresponds to such a set of descriptors defines what we will refer to as the ‘sensory quality state’ of the meat. This ‘sensory quality state’ of the meat is affected by the preparation technique and the parameters used in the technique. For long-time low-temperature sous-vide treatment, the main parameters are time and temperature. The sensory scores will change as a function of time and temperature when the heat-initiated processes take place during cooking and describe a trajectory through the space of ‘sensory quality states’. The chef's challenge is then to influence this trajectory to reach a desired end-point, which depends on the actual dish. The molecular processes behind the sensory changes during cooking cover a wide range of processes of chemical and physical nature and both thermodynamic and kinetic aspects need to be considered. For example, generation of aroma and taste is a result of chemical reactions that generate new components, which can be reactive or volatile and thus diminish in concentration subsequently. The combined kinetics and temperature dependence of such a set of consecutive reactions and processes will then determine changes in taste and aroma. With regards to texture, meat contains both dissolved sarcoplasmic proteins, e.g. enzymes and myoglobin, and structural proteins that form the fibres responsible of muscle function and provides the mechanical strengths of the fibres . All of these proteins undergo thermal denaturation during heat treatment but with varying denaturation temperatures and rates. Changes in tenderness and toughness of meat during cooking are usually attributed to denaturation of the proteins [4, 5], whereas the long term tenderization during long-time low-temperature treatment sometimes is attributed to solubilisation of collagen in the meat  or enzymatic processes . Tornberg  gives a detailed description of the denaturation of meat proteins in a thorough review article. Heat denaturation of proteins can be described from a thermodynamic point of view. From this viewpoint, a well-defined denaturation temperature can be identified for each protein . In a relatively narrow temperature zone around the denaturation temperature, native and denatured protein co-exist. This zone separates the low temperature region where the proteins are stable in their native state from the temperature region where the proteins are stable in their denatured form. Denaturation will not occur below the denaturation temperature even for a very long heat treatment according to this thermodynamic description. Some sensory properties can thus never be achieved with temperatures outside (below or above) the denaturation temperature zone, independent of cooking time. Consequently, cooking time is of less or no importance for this thermodynamic scenario, and the gastronomic outcome is mostly related to the cooking temperature. A kinetic approach to protein denaturation also exists . In the simplest form of the kinetic approach, native proteins are considered unstable towards denaturation at any temperature and will spontaneously denature with a temperature-dependent rate usually taken to be in agreement with the Arrhenius equation. In this approach, each protein is characterized by an activation enthalpy for denaturation, which is usually large. This means that the rate of denaturation is extremely small and without significance at low temperatures, corresponding to storage of raw meat, and significant at the higher temperatures, corresponding to cooking. When purely kinetic behaviour is considered, the simplest scenario exists if a temperature increase accelerates all molecular processes to the same degree. In this simple case, the meat travels through the same trajectory in the space of ‘sensory quality states’, and the temperature only affects the rate of the changes and thereby the time to reach the desired point. However, if temperature affects the rates of the occurring molecular processes differently, the trajectory is changed. This means that changes in cooking temperature may cause changes in the sensory properties that can be achieved and not only a change in the rate of passing through the states. In the present study, we apply the multivariate data analysis method GEneralised Multiplicative ANalysis Of VAriance (GEMANOVA)  to explore the interrelation between cooking temperature and time and the resulting sensory properties of cooked meat as expressed in the sensory dataset of Mortensen et al. . GEMANOVA is a statistical method that focuses on the interaction effects between a number of main factors and a suitable choice in this dataset where time-temperature interaction is expected. GEMANOVA will also derive the important underlying dimensions in the original variables through reduction to a number of components. The argumentation for the present study is that the sensory state of heat-treated meat is a consequence of underlying molecular processes and especially their response to both time and temperature. The detailed interrelationship is currently unknown and sensory properties cannot directly be deduced from molecular properties and vice versa. We make use of GEMANOVA to extract the dominant time-temperature behaviours of the combination of the sensory properties (the ‘sensory quality state’) of meat and to evaluate the nature of the relevant processes (i.e. thermodynamic, kinetic, strong or weak dependency of temperature). This provides an overview of how to obtain desired sensory properties of meat and thus to simplify the knowledge needed to give guidance to practical cooking. Furthermore, it serves as input to the long term quest for identifying the responsible and most relevant molecular processes for the sensory properties of cooked meat. The most relevant processes should show same time-temperature dependency as the resulting sensory properties. A study of the sensory properties of beef eye of round sous-vide cooked at 56°C, 58°C, and 60°C for 3, 6, 9, and 12 h was performed by Mortensen et al. according to contemporary use of long-time low-temperature sous-vide cooking [2, 3]. A sensory descriptive analysis was carried out using pieces of meat sufficiently small to ensure that isothermal conditions were prevailing throughout most of the thermal treatment and thereby minimizing effects of thermal conduction. The descriptors shown in Table 1 were used and the data analyzed by univariate statistics. It was shown that the sensory descriptors could be divided into two main groups when the qualitative response to time and temperature was considered. In one group, the time and temperature influenced the descriptors in the same direction. In the other group, time and temperature caused changes in descriptors in opposite directions. To continue to a quantitative analysis, a principal component analysis (PCA) has now been performed on the data (averaged across replicates and panellists) to uncover more refined time-temperature behaviour in the data set. The PCA resulted in a two-component model. Figure 1 shows the scores and loadings plots for the two components. These two PCA components describe 96% of the variance in the averaged data. The model thus describes almost all product variance, i.e. two underlying dimensions essentially describe the variation in the data set. In the scores plot, the points representing the time and temperature treatments of the samples are arranged in a grid that corresponds to the experimental design. As no regions of overlapping points exists, each time-temperature treatment provides a unique set of sensory properties or ‘sensory quality state’, and none of the other time-temperature combinations can result in the exact same combination of sensory properties. List of descriptors for sensory analysis (cf. Mortensen et al. for reference materials and details). Principal component scores and loadings plot. Principal component scores plot (top) and loadings plot (bottom) of the mean values over panellists and sessions, centred data. Component 1 explains 72% of the variation and component 2 24%. The sample ID’s are constructed as temperature-time, i.e. 56-03 denotes the sample cooked at 56°C for 3 h. For details about descriptor clusters, please refer to the text and Table 2. Component 1 spans the variations in the data between the sample that was cooked for the shortest time at the lowest temperature and the sample cooked for the longest time at the highest temperature. Component 1 thus reflects what can be called ‘total cooking’ or ‘accumulated heat treatment’. Component 2 spans the variation in the data between the two ‘opposing’ combinations of time and temperature, e.g. samples cooked at the lowest temperature for the longest time and the sample cooked for the shortest time at the highest temperature. Figure 1 shows that blood/metal aroma and blood/metal flavour, coherency, and juiciness are at their highest at the shortest time and the lowest temperature (56°C for 3 h). So the minimum ‘total cooking’ promotes the blood/metal aroma and blood/metal flavour, coherency, and juiciness. Maximizing ‘total cooking’ (60°C for 12 h) increases the descriptors brown surface, boiled veal aroma, boiled veal flavour, brothy aroma, brothy flavour, and mouth residual. At the same time, blood/metal aroma and blood/metal flavour, coherency, and juiciness are diminished. In the second dimension, tenderness is increased by cooking at the lowest temperature for the longest time (56°C for 12 h), and chewing resistance, chewing time, toughness, rubbery, and hardness are diminished. Cooking at the highest temperature for the shortest time (60°C for 3 h) increases chewing resistance, chewing time, toughness, rubbery, and hardness. The loadings plot from the PCA in Figure 1 shows that six clusters of descriptors can be identified. Within each cluster, the time-temperature behaviour is similar. The clusters are shown in Figure 1 and in Table 2. Cluster A1 has negative loadings on component 1 and numerically low loadings on component 2. Cluster A2 has positive loadings on component 1 and numerically low loadings on component 2. Clusters B1 and B2 have numerically low loadings on PC1, and B1 has positive and B2 negative loadings on component 2. Cluster C1 is situated between A1 and B1 and has positive loadings on component 2 and negative loadings on component 1. The last cluster C2 is to be found between A2 and B2 and has positive loadings on component 1 and negative loadings on component 2. Clusters A1 and A2 together create a group of descriptors, group A, clusters B1 and B2 together form group B, and clusters C1 and C2 form group C, see Table 2. Each of the groups can be viewed as one entity despite opposite locations of each cluster in the group. This can be seen by transforming the descriptors of one cluster into ‘inverse descriptors’. For example, the ‘inverse descriptor’ that is a result of the transformation ‘15 − juiciness’ would be grouped with brown surface. Hence, the choice of descriptor gives an arbitrary, but semantically meaningful, subdivision of the group into two clusters. Group A is aligned along component 1, group B varies along component 2, and the variation in group C is approximately aligned with the temperature direction. For example, brown surface of group A is promoted by treatments in the negative part of component 1 (high temperature and long time). On the other hand, juiciness, also from group A, is promoted by treatments corresponding to positive values on component 1 (low temperature and short time). The grouping of descriptors of Mortensen et al. , where the descriptors were purely grouped qualitatively according to their qualitative response to time and temperature, corresponds to the dimensions in the PCA where time and temperature affect the sensory properties of the meat in the same direction in dimension 1, corresponding to group A. In dimension 2, the time and temperature affect the sensory properties of the meat in opposite directions, corresponding to group B. The PCA, however, expands this picture further by introducing a third group, group C, with a time-temperature behaviour that is somewhat between group A and group B. Table 2 shows the separation of descriptors into three groups (A, B, and C). Descriptors regarding flavour and appearance are mainly present in group A along with a few texture descriptors. Group B only holds information about texture, and group C contains information about texture, flavour, and appearance. This indicates that the processes related to the majority of the texture changes by nature differ from the processes related to flavour changes. We will return to the interpretation from a chemical and physical viewpoint in the following section presenting GEMANOVA modelling. In Mortensen et al. , no interaction effect between time and temperature was found in mixed model ANOVA, which means that the time and temperature effects are independent of each other. This contradicts usual chemical/physical understanding and common sense, as the typical effect of increasing temperature is that processes are accelerated. To investigate possible interaction effects thoroughly and as the interaction between time and temperature is of particular interest, we have chosen to use GEMANOVA, as this method has special focus on interaction effects. GEMANOVA modelling was carried out using the model described in Equation (1). To test the fit of the various models, the correlation between the measured and estimated values for each descriptor was calculated as the correlation coefficient, R 2. The results are shown in Table 3. It was attempted to make a single GEMANOVA model for the entire dataset, group ABC, but the overall model performance for some descriptors was poor, as seen by the very low value of R 2 for veal flavour, hardness, chewing resistance, toughness, chewing time, rubbery and tenderness. This indicates that no common time-temperature behaviour for all descriptors exists, which is consistent with the conclusions from the PCA, where three groups were found. When the dataset is split in two, group AC and group B, the performance is remarkably improved for the descriptors belonging to group B as seen by the R 2 values. The descriptors from group C are not described well by the model. This confirms that there is a third group of descriptors with another time-temperature behaviour. Improvement of the modelling of group C can be obtained by an additional splitting of group AC in two—group A and group C. Removing group C from group AC results in a slight improvement of the degree of correlation for brothy aroma and brothy flavour in the model for group A. This is consistent with these descriptors’ position in the loadings plot from the PCA, as brothy aroma and brothy flavour are the descriptors that are least correlated to the descriptors in group C.
Group ABC consists of the entire dataset. Group AC is the union of group A and group C.
The time-temperature behaviour of all groups according to the GEMANOVA models is shown in Figure 2. 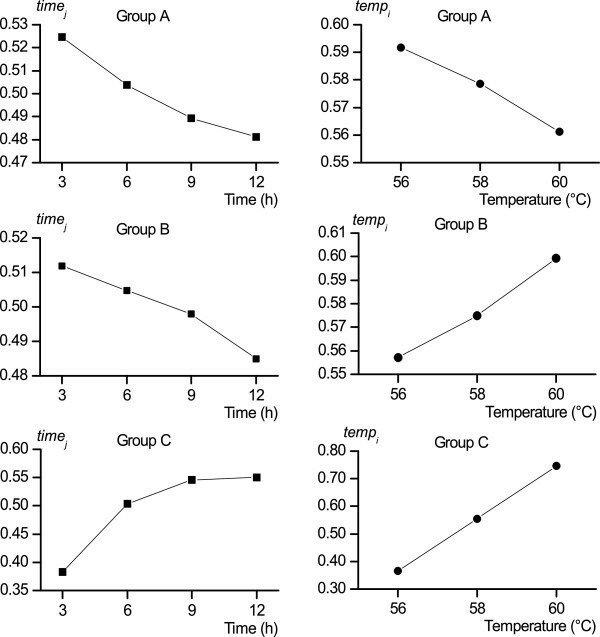 For group A, the time and temperature effects (temp i and time j ) decrease with time and temperature, respectively, whereas the effects decrease with time and increase with temperature for group B. In group C, the effects increase with both time and temperature. Thus, group B shows effects of time and temperature in opposite directions whereas group A and group C show the effects of temperature and time in the same direction. Thus, group B is clearly different from group A and group C with respect to time-temperature behaviour, whereas groups A and C are qualitatively more related as the time-temperature behaviour in these groups is more similar. Parameters from GEMANOVA models. Parameters from GEMANOVA models (time j and temp i ) for groups A, B, and C.
Figure 3 shows the combined time and temperature (effects ij —see Equation (2)) effect common for each group. For group A, the plot consists of three curves decreasing with time and with the curve for 56°C top and 60°C bottom. The steepness of the curve decreases with time. For group B, the steepness increases with time, in contrast to the group A pattern. The 60°C line is the top line and 56°C line is the bottom line. For group C, the curves increase with time, with the 60°C line top and the 56°C line bottom. It is important to notice that group A and group C show the same trend in the effect of time and temperature but that the GEMANOVA models are parameterized in such a way that this fact is less clear from the effects depicted in Figure 3. Effects of time and temperature combined, descriptor, and level. Combined time and temperature effect (effects ij ) for GEMANOVA models is on the left. On the right, descriptor effect (descrip k ) and level (level k ) are shown. From Table 3, it is apparent that the GEMANOVA models overall describe the data well, as the models for all descriptors have a high degree of correlation between the measured sensory score and the estimated score. This means that three models describe the sensory trajectory in 18 descriptors very precisely. However, the analysis with only two models (group AC and group B) also describes data fairly well. A two-component model is in agreement with the previously found two-component time-temperature behaviour in data . In other words, at least two underlying phenomena are present, and additional precision in description of the data can be obtained by applying a third model to describe a phenomenon with time-temperature behaviour that is somewhat different from the behaviour in group A. Figure 3 shows that the same effect can be obtained by different combinations of time and temperature in each of the plots. This means that time and temperature is somewhat interchangeable when considering each group (A, B, or C) of sensory descriptors separately, i.e. the same ‘sensory quality state’ can be obtained in different ways. However, the direction of the temperature effect and the time needed to compensate for a change in temperature is very different for the three groups. Group A shows a large effect of time and some effect of temperature. Group B shows a lesser dependency of time and thus relatively larger effect of temperature. The quantitative difference between the two related groups, groups A and C, is evident as a much larger time compensation is needed in group C. Group C thus shows a much weaker dependency on time and is therefore mostly controlled by temperature. 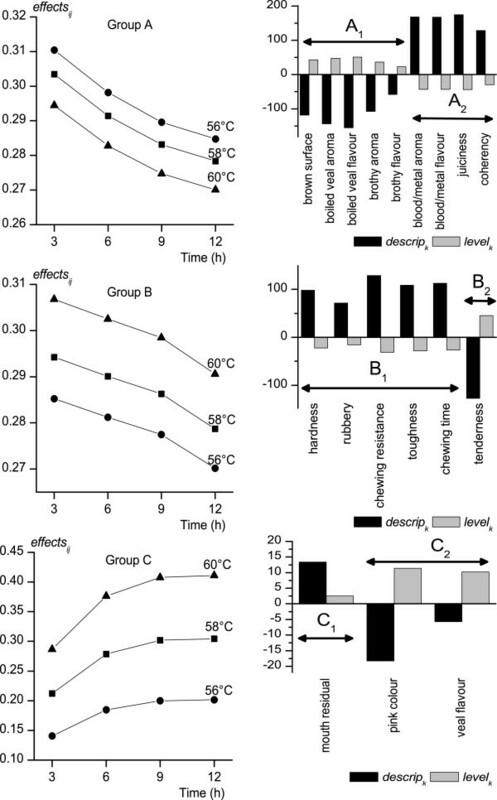 The different effects of time and temperature on the various groups of sensory descriptors render universal time-temperature compensation impossible. This was also pointed out by Mortensen et al. and evident from the PCA plots in Figure 1. This means that each of the used combinations of cooking time and temperature gives a unique combination of sensory properties, the ‘sensory quality state’ of the meat—a state which cannot be achieved by other combinations of time and temperature. For all practical purposes, we suggest a minimal and therefore more operational set of descriptors to be used by chefs consisting of juiciness, tenderness and pink colour, which belong to groups A, B, and C, respectively. The GEMANOVA estimates and raw average values of the sensory scores for the descriptors are depicted in Figure 4 to give a graphical impression of the agreement between estimates and raw data. The qualitative similarities between juiciness (group A) and pink colour (group C) are evident in Figure 4. This figure also clearly demonstrates the very different effect of time on the three descriptors—with a strong effect on juiciness, a medium effect on tenderness and a lesser effect on pink colour. GEMANOVA model estimates and raw data. GEMANOVA model estimates and raw data for juiciness, tenderness and pink colour. Estimated data is marked by filled symbols. In gastronomic literature, it is often stated that in cooking of eggs, the denaturation of the egg white is controlled by the cooking temperature only, and the cooking time receives no attention (e.g. and ). This leads to the assumption that denaturation of proteins in the egg white is thermodynamic of nature. In contrast to this, it has been shown that the consistency of egg yolk is affected by both time and temperature and thus clearly of a kinetic nature . In the latter case, the chef can choose between fast high-temperature routes and slower and more robust low-temperature routes that lead to the same consistency of egg yolks. In the present study, the analysis of the sensory data demonstrates that none of the three descriptor groups are controlled by molecular phenomena with a true thermodynamic nature. This is seen by a significant effect of time on all three groups of descriptors. The analysis further showed that descriptors within each of the three identified groups have the same kinetic response to time and temperature. This means that within each group, the same ‘sensory quality state’ can be achieved by a number of time-temperature courses. Three different kinetic responses to temperature were shown to exist in the present study. This means that when the temperature is changed, the change in the rates of the processes will differ between the three groups. Thus, not only the time needed to reach a desired ‘sensory quality state’ will change but also a trajectory of new ‘sensory quality states’ will be travelled when the cooking temperature is changed. Consequently, a specific ‘sensory quality state’ can only be reached by one route at one temperature. Pink colour (as well as veal flavour and mouth residual) of group C is somewhat thermodynamic of nature as a smaller effect of time is observed for this descriptor, see Figure 4. In practical beef cooking, the core temperature of the meat is often monitored to stop the cooking process when the desired ‘sensory quality state’ is obtained. In the absence of a suitable temperature probe, the degree of pink colour in the core is frequently used as an indicator of the core temperature and is usually described by popular terms ranging from ‘rare’ to ‘well done’. The colour is thus used as an indication of doneness and sensory properties. However, the colour is not a good indication of the overall sensory properties of the meat because of the strong effect of cooking time for descriptors of groups A and B. This time-effect means that all other sensory properties of the meat are not uniquely given by the obtained temperature, as they are strongly affected by the thermal history, i.e. the time spent to reach the final temperature. Thus, terms like ‘medium rare’ and ‘well done’ are not well-defined ‘sensory quality states’. The reduction or simplification of the individual behaviour of 18 descriptors to the behaviour of only three descriptor groups greatly simplifies the description of the fundamental sensory behaviour in meat cookery. The observation of three distinctly different phenomena in the sensory data is intriguing as to the underlying molecular phenomena. The descriptors of group A describe mostly non-textural properties such as taste and aroma, and considering the range of descriptors, there might be several reactions of this type. Each shows the same properties with respect to temperature acceleration, i.e. the same level of activation energy. The meat chemist and aroma chemist with culinary interest must in future look for several chemical reactions showing this behaviour. For the descriptors of group B, which are purely related to texture, time and temperature are observed to have opposite effects, i.e. increasing temperature can diminish tenderness, and prolonged time can increase the property. We suggest a two-step process that causes the opposite effects of time and temperature. The first reaction, which is fast and promoted by temperature, changes the texture in one direction. The following reaction is slower and changes the texture in the opposite direction. Here, future research should be focused on finding at least two ‘opposing’ processes of relevant time scale and temperature response involving structural molecules of meat, and it should be emphasized that no instrumental textural measurements on meat has yet indicated such opposing time-temperature behaviour. For the less time-dependent behaviour of group C, the chemistry of colour of meat essentially is well understood (see Barham et al. for an overview), and the focus should be on understanding the processes behind the development of mouth residual, which is most likely also related to the macromolecular part of the meat. Three different underlying phenomena are responsible for the changes in the sensory properties during long-time low-temperature cooking of meat. By the aid of GEMANOVA modelling, 18 sensory descriptors can be reduced to three groups with quantitatively same time-temperature behaviours. This gives a simpler picture of the possibilities for the chef performing sous-vide cooking of meat. The present study shows a direction for meat scientists’ future elucidation of the most important physical and chemical phenomena in meat cookery. The data used in this paper is from a study performed on cooking of beef eye of round (bovine semitendinosus) described in Mortensen et al. . Cooking time and temperature were varied in a full factorial design with time on four levels (3, 6, 9, and 12 h) and temperature on three levels (56°C, 58°C, and 60°C). Sensory descriptive analysis was performed with ten panellists, four sessions (each consisting of a replicate) and 22 descriptors. As some data was missing for one panellist, this panellist was left out to make the data set balanced. Only descriptors with significant effects of temperature and/or time are included. This leaves a dataset with nine panellists and 18 descriptors. The descriptors consisted of two descriptors regarding the appearance (colour) of the sample, three aroma descriptors, four flavour descriptors and nine texture descriptors . The descriptors and their definitions are listed in Table 1. PCA was performed on average data over panellists and sessions using Unscrambler (version 10, CAMO, Norway). The average values were used as the performance of all panellists was satisfactory assessed by p*MSE plots  using PanelCheck (version 1.4.0, Nofima, Norway). For the GEMANOVA analysis, data was rearranged in a 4 × 3 × 18 array using the average values over panellists and sessions as in the PCA. Time and temperature were separated in two modes, in a model with a trilinear term and a main effect of descriptor. The data was analyzed using MATLAB (version 7.7.0, Mathworks, USA) and an algorithm described by Bro and Jakobsen  downloaded from http://www.models.life.ku.dk/gemanova. where i = (1, 2, 3), j = (1, 2, 3, 4), k = (1, …,N) and temp i is the effect of temperature, time j is the effect of time, descrip k is the effect of descriptor, level k is the main effect of descriptor and residual ijk is the residual. N is the number of descriptors in the model. where i = (1, 2, 3), j = (1, 2, 3, 4), and temp i is the effect of temperature, and time j is the effect of time. For each set of sensory data, the GEMANOVA parameters were determined 50 times, and the best set of parameters was chosen based on the sums of squares values for the models. The performance of the models on individual descriptors was assessed by R 2 values between estimated and average measured sensory score. This research was sponsored by the grant ‘Molecular Gastronomy—the scientific study of deliciousness and its physical and chemical basis’ by the Danish Council for Independent Research | Technology and Production Sciences (FTP). LMM conceived the idea of the study, designed the details of its data analysis, and analyzed the data. LMM and JR interpreted the data and drafted the manuscript. MBF and LHS have been involved in revising the scientific content of the manuscript and contributed to the interpretation of the data in the later stages of the process. All authors read and approved the final manuscript.